Last year saw the reveal and release of Kaladesh, a world that resembled an almost-India, but that also had weird magical energy, unfettered invention, and helicopters that were so strong that they needed to be banned from the game almost immediately. In a few weeks, Wizards of the Coast is following that set up with another magical world that is inspired by real-world ideas. If Kaladesh was a sort of “what if?” question paired with historical India, then Amonkhet is a similar “what if?” paired with ancient Egypt. There are giant statues. There are pyramids. There are embalmings, and there are weird zombies covered in ceremonial wrappings. Things really amp up on Amonkhet, though, because there gods walk among people there. 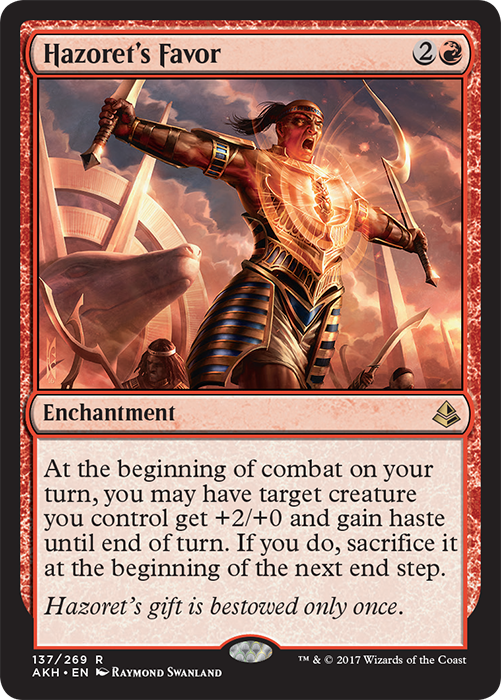 As best I can tell, the gods walk among the people of Amonkhet to bully them. This entire world is dedicated to something called The Trials. They’re a way of proving yourself worthy to the gods: You run around, do heroic and difficult stuff, and then you’re either acknowledged as good or you die because you’re bad. The gods are there to check that out, and the god that I have some specific information on is Hazoret. 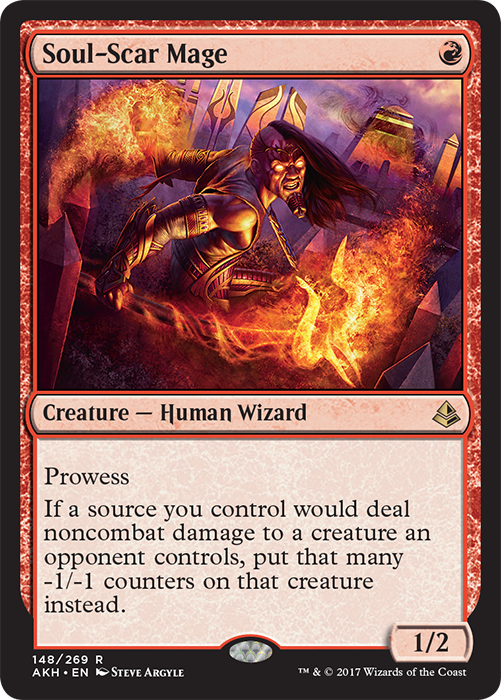 As this card demonstrates, Hazoret is definitely a jerk. Would a god who is good pump you full of Rage Juice and then throw you into an enemy? Even worse, if the creature survives, it will burn out and have to be sacrificed. Was Neil Young singing about Hazoret when he told us it was better to burn out with favor than it is to rust? Only time will tell. The people who enter into the trials and have to deal with Hazoret seem like they’re living their worst life, but I guess if they make it through, they might be doing a little better than I am. I mean, the only trials I have ever done well in are time trials for Sega Saturn racing games. Don’t get me wrong, I’m good, but not “good like a muscle mage is good” good. If you’re interested in learning more about Hazoret and his position in the trials, I have two very excellent pages from the Amonkhet art book that will coming out in the future. I’ve really enjoyed the Zendikar, Innistrad, and Kaladesh books that have been made so far, and I bet that the Amonkhet book will have some really lush backstories for the characters who only get hinted at in the books.